The crew gathered, a few nights ago to celebrate a birthday. It was a good omen the birthday girl chose this spot. It is well documented I am a fan of all things Asian so for me this was positive karma. 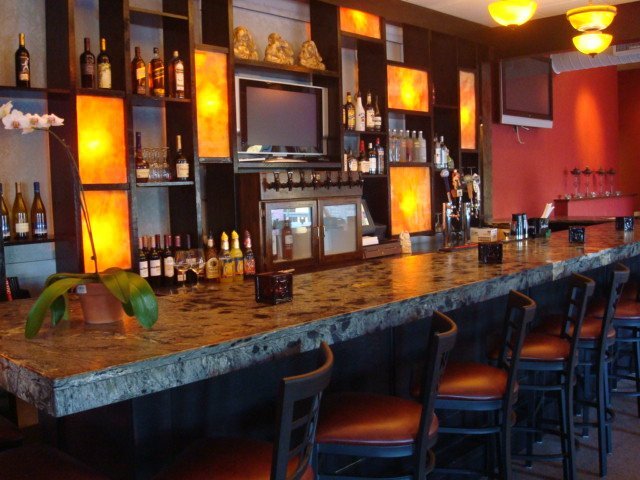 Originally opened as Buddha Belly a few years ago, this incarnation is much superior both in food and service. There have been a few cosmetic changes, but overall the interior remains most inviting, with soft lighting, bamboo and soft drapes, shadow boxes of various shapes and sizes plus an assortment Buddhas. 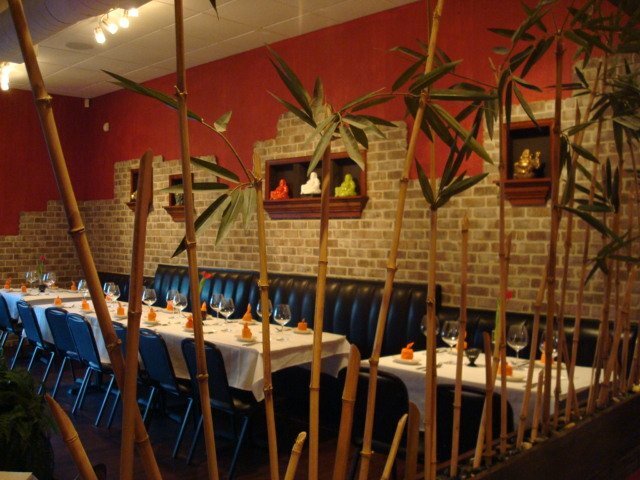 A very Zen like atmosphere, that lends itself to a relaxed dining experience. 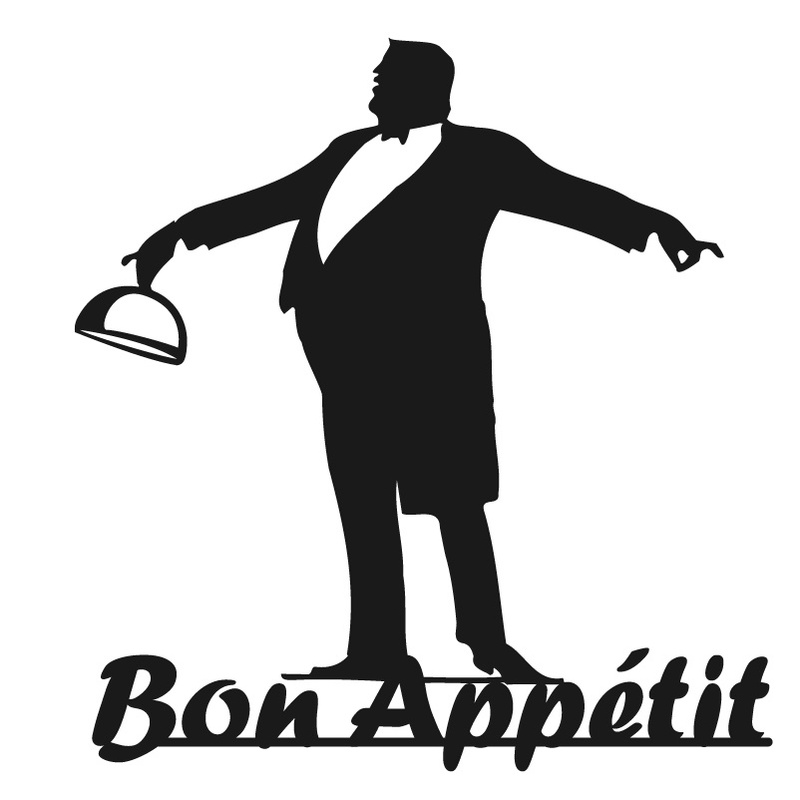 Wait staff is smartly dressed, and well versed in items on the well populated menu. Service is relaxed, but efficient. 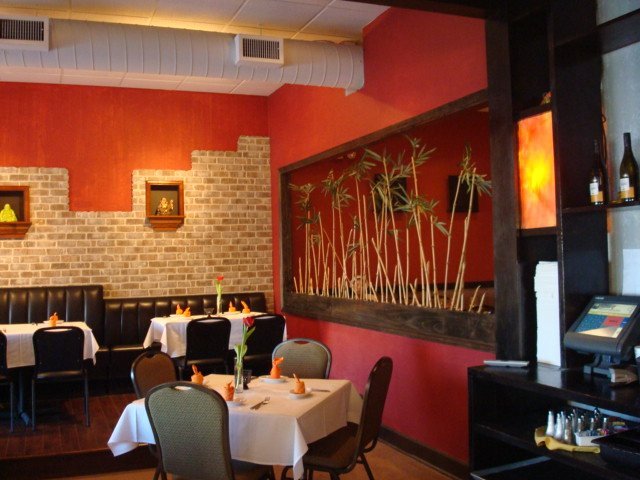 Menu is heavily weighted with Thai food selection with veterinarian options. There is certainly more variety than I have seen on other menus around town. 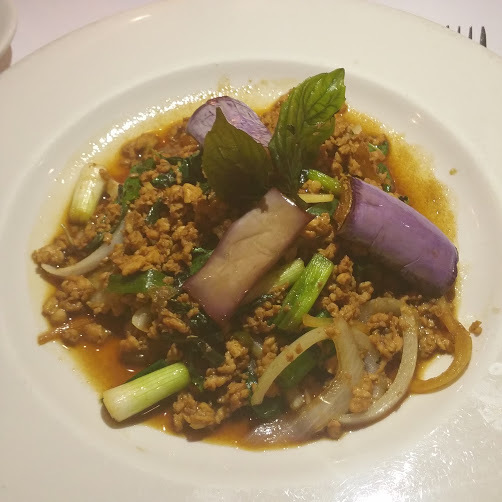 Let’s get to the food, it takes a while to get through all the choices, there are many dishes and to those not familiar with Thai could prove to be a daunting task. Most of us are familiar with the dishes and have our favorites, but tonight for what ever reason, we all decided to try something new. 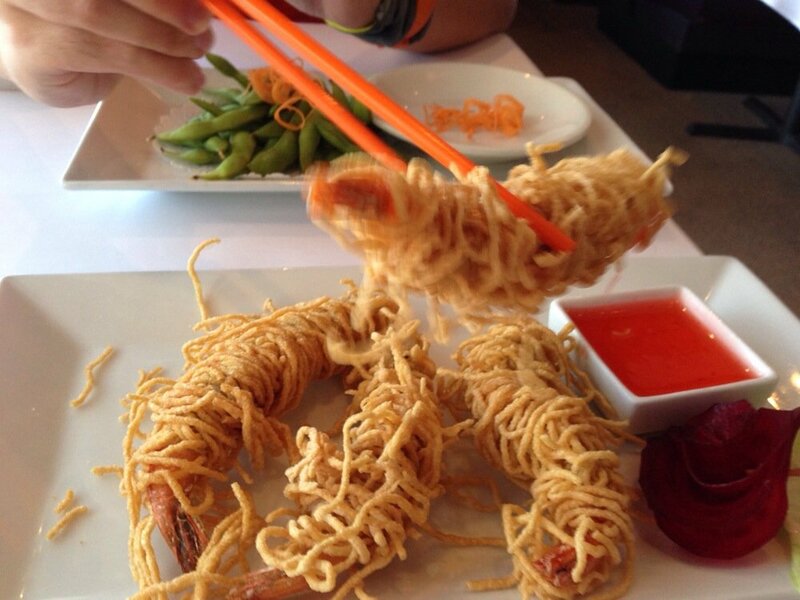 We started with some soup and a noodle wrapped shrimp dish. 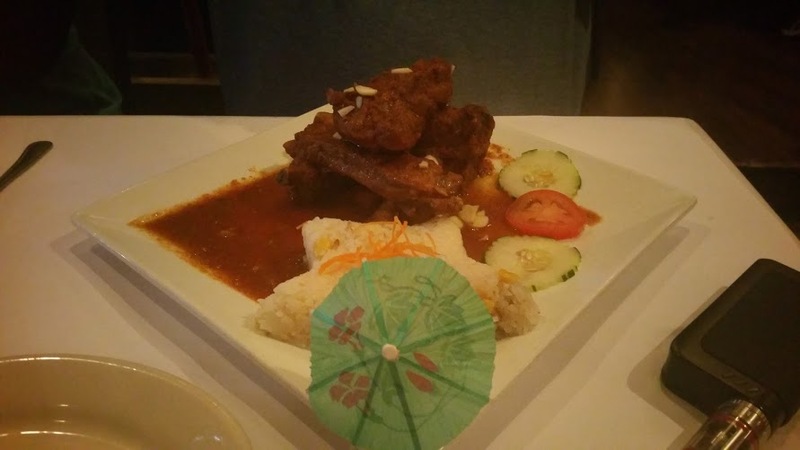 I have had this dish on a previous visit and did not care for it. Strange texture and not very flavorful. The dipping sauce is a sweet and sour type dish, which I am not a fan of. The owner of the found it to her liking. 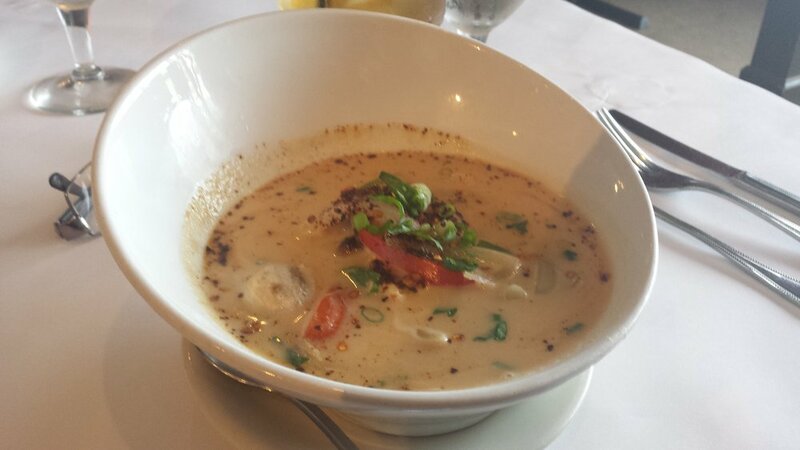 Two different soups one Coconut Tom Kha, a most flavorful and pungent, containing kaffar lime leaves, lemon grass, and ginger with mushroom, tomatoes and bell peppers. This is my favorite soup but was not my choice this time. It was beautifully presented. The flavor was remarkable. All soups come with a choice of protein. My choice this evening Tom Yom, a spicy broth with mushrooms, tomatoes and bell pepper. I am not a green pepper person and it was not a problem to order the soup with out this ingredient. 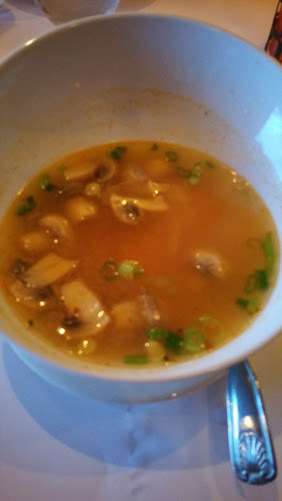 Not knowing what to expect I was highly pleased, the broth was pungent and pleasant on the taste buds. So typical of me, it was quite easy and shameless to drink the broth from the bowl once all the goodies were gone. This was voted an order it again dish. 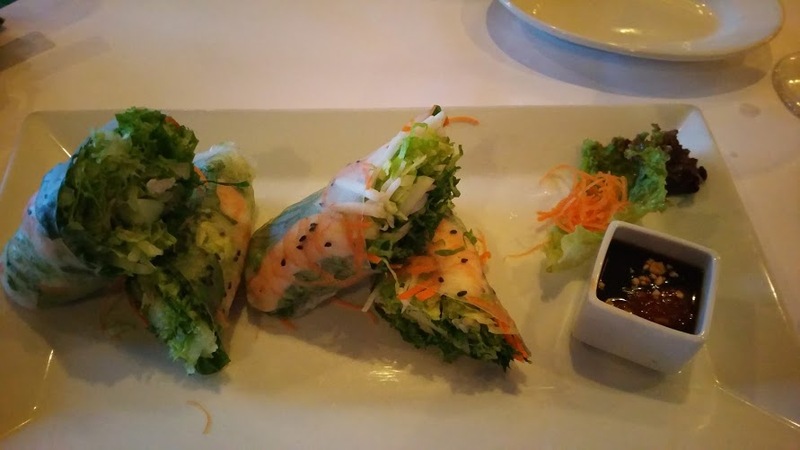 Summer Roll, was also a starter choice, this was packed full of the freshest of greens, heavy on the cilantro side, and a healthy sized shrimp. It looked like spring on the plate. The home-made hoisin sauce that accompanied the dish was delightful in flavor and consistency. 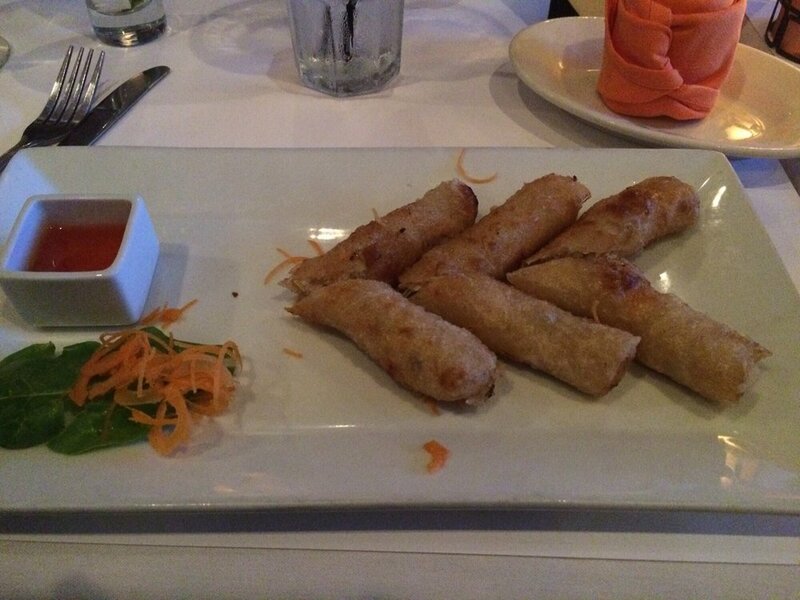 The last starter to make it to the table was Siam Spring Roll, a fried roll served with a tangy sweet dipping sauce. These were passed around and quickly dispatched. Entrees, were varied and everyone was pleased, We all eat out together several time a week, so passing dishes around the table is a way of life for us. Plus it is a great way to try something for a first time. It is seldom two of the same dishes are ordered when we are together. Lets start with the well know. Yellow Curry with chicken. 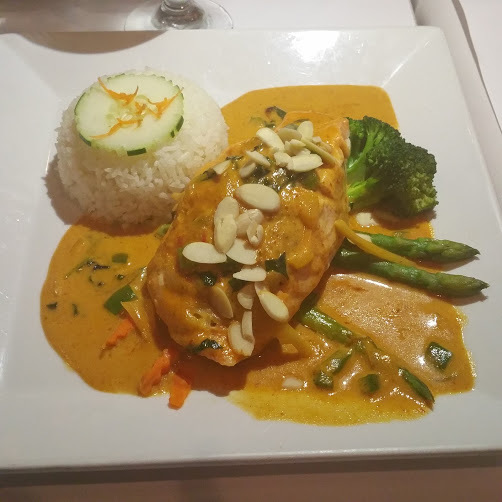 The color of this dish was like sunshine, a beautiful curry aroma filled the senses and just invites one to try it. Next up the Curried Stuffed Salmon, again I can’t rave enough about presentation. If we eat with our eyes first this dish was devoured before it touched the table. Everyone was wanting to try this dish. For me I am a salmon purist and on the other end I am a curry fan, so I just tasted the curry and it was amazing. 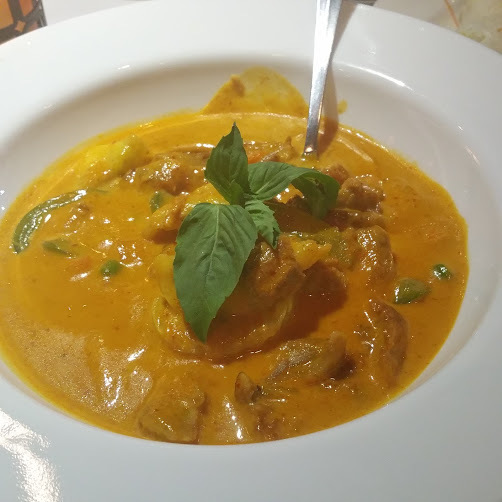 I am always overwhelmed by the beauty of this food and how different the Thai curry is from traditional Indian curry yet both are the best dishes ever. Moving on a Kalua Ribs, marinated pork ribs in a pineapple honey glaze is served with a most tasty coconut rice. 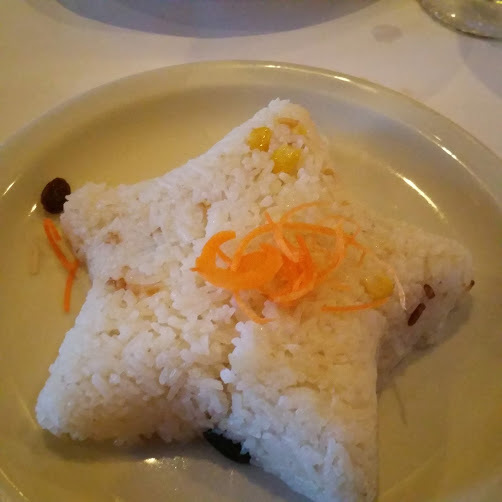 The rice was so good we ordered one just for the table. For me the Kra Pow ( Hot Stuff), a stir fry with chili, garlic, onion eggplant and holy basil. I chose the chicken for my protein. I ordered this dish for the name, spicy is my favorite, but it was far from that. Mile at best, but I figured out I should have asked what heat level the restaurant was using, so I understood why they sent out the mild. It was still a very satisfying dish, and the vegetables not overcooked and chicken tender. Sauce was flavorful….Eggplant just amazing to look at. So I have saved the best for last, the star dish of the evening was the special chicken. 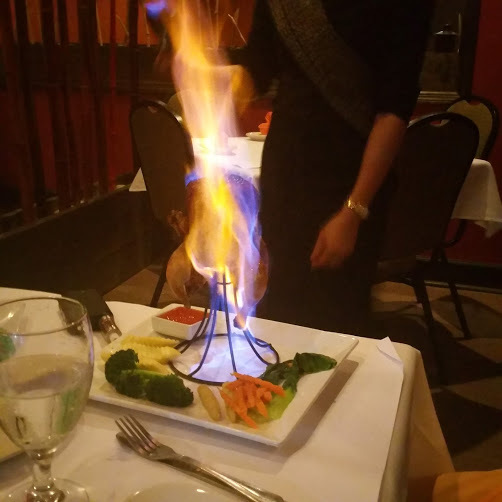 Yes they set it on fire at the table and it was well received by all the diners around us. We loved the show. I am sure you all recognize the stand where the bird is blazing away. I have two of them in my kitchen. Once the flame was gone, a beautiful bird sat in all it’s charge glory just begging to be eaten. We each took as piece and were quite delighted with the moistness and flavor. We fought over the skin. 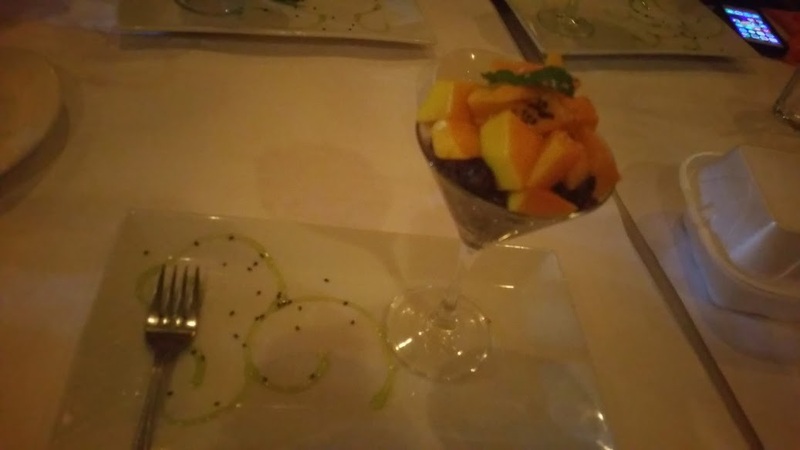 We were all totally sated, but one intrepid diner managed to find space for the Mango w forbidden rice. That did not work out well since we forced him to share. This rice was black with a much firmer texture than white rice. I actually preferred this rice. Sweet mango cold and ripe not soft. Over all we gave this spot a 4.5 to 5. It is certainly a place to try if you are at the beach, or well worth the drive from town. 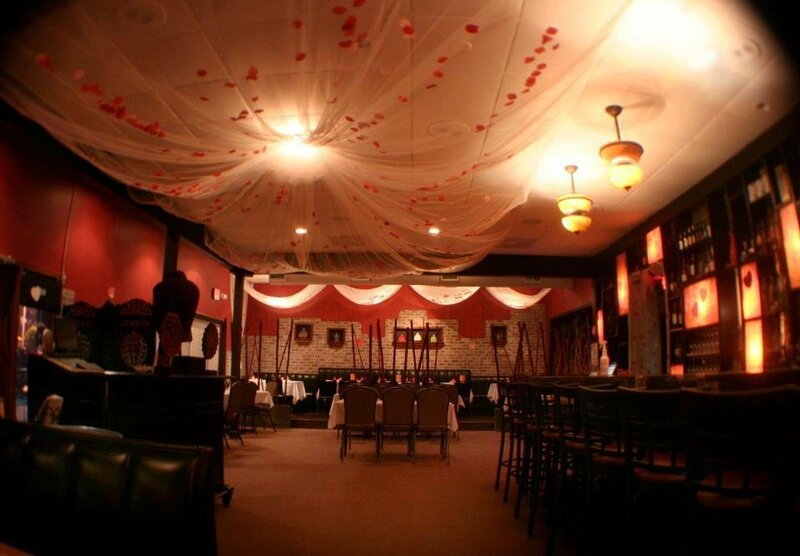 They are well equipped and staffer to host large parties, but I would suggest reservations for anything over 5.